-as an indirect backlash against his Presidency, people have turned against his mouthpieces like Alex Jones, Bill O'Reilly, What's-his-stupid-face I keep forgetting, etc., none of which will be able to cheer for him in 2020. All he got left is Limbaugh, Coulter and Hannity, two of which are not going to support him unless he gets the Wall. The South is a Republican stronghold. It’s possible that some states like Florida flip but it isn’t something to count on. In addition to that a lot of Western states are as well (Wyoming, Nebraska, etc.). Now, that’s not a lot of electoral votes but combined with Southern states it adds up. It’s possible that Arizona flips but it’s not something to count on. Texas with its votes are solidly Republican. California counterbalances that, so does New York. That leaves the bloc of states that used to be the “Blue Wall,” with the most important ones being Pennsylvania and Ohio. You need the urban and suburban votes to cancel out the rural votes that go Republican. It didn’t happen in 2016. Now, certain things broke Trump’s way in 2016. Clinton isn’t particularly liked by anybody. That includes me and I voted for her. A lot of people didn’t vote or voted third party and that killed any chance of urban and suburban votes canceling the rural votes. I think everyone learned a valuable lesson in all this and will get out to vote and will not waste them. The blue wave that took back Congress showed that. The depressing part is that Trump’s popularity remains high among Republicans. They will vote for him no matter what. So right now I give him decent odds. 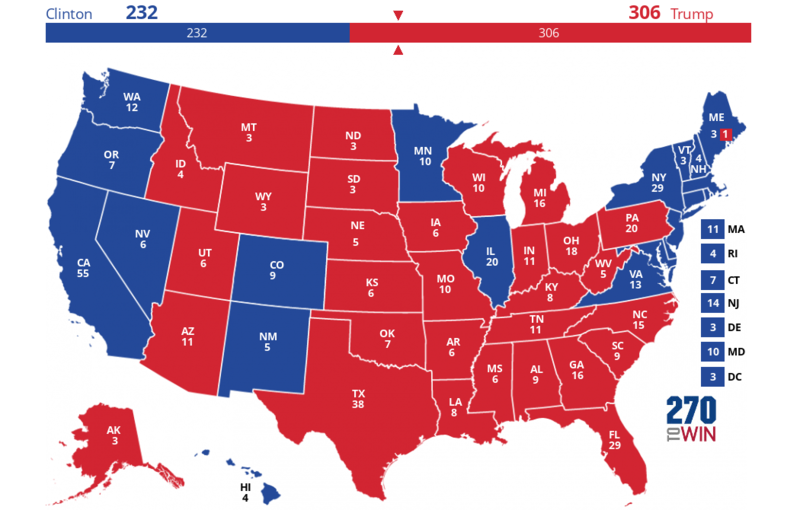 Remember, no one thought he would win in 2016. I’m not going to make that mistake. If he wins again then we are all truly screwed unless the Senate flips and Congress remains in the hands of the Democrats. I am changing my opinion on the wall. I now think that Pelosi should give him enough $ to build a small portion of it as a test. Then have the military conduct that test. I am thinking 500lb bombs and above... bunker busters too. Surely the military could use a new bombing range? Please do give fair warnings so that not too many unintended victims are killed. After all, Mar-a-Lago does have low paid groundskeepers in addition to high income visitors and we wouldn't want them to be hit from flying wall bits. Yes. That would be me, I’m a nefarious agent of the Deep State. You know, for the life of me I don't understand what "lost productivity" means. On the face of it........seems to me "the economy" should be SAVING the cost of the paychecks not paid out. Is that even an offset?.......or is it just negatives all the way down. anyone brave enough to offer an explanation that would make sense to a high schooler? First of all, the back-pay will be paid out, so no savings there. Trump and Congress signed that bill. Assuming the Shutdown ends, all these things can be done, but unless we hire way more state workers, we will never catch up - the government-dependent economy will have done only 11/12th of the work it does in a normal year (assuming the shutdown ends soon). Well, back pay is given to about half of those closed down....ie not paid to contractors, only those with actual fed jobs. On that point....seems to me that the money would have been paid anyway ....so how is paying it a "loss."? If overtime is paid to catch up when work resumes, THAT would be an "added" cost and I don't think there is too much of that going on. I still don't get it. My gut says its all a "theoretical argument" along the lines of "If you include xyz....then abc." but paying back wages doesn't feel like a loss to me. I'm just that simple minded. no, it's not the back-pay. But there are oil companies that couldn't drill because they couldn't get a necessary stamp on the right piece of paper at the right time - an issue that Trump has fixed via Executive Order now. But regardless of how quickly the government opens, the rig can't pump more oil to make up for the lost month. Well, I assume/guess/pull out of my a.. that we DO mostly catch up.............and if we don't, those "costs" are actually saved? Really, even a weaker case than back wages paid? Grants not funded. That saves money..........CONTRA: I understand how "the economy" suffers from lack of grants........the government/taxpayers "save"........so.....in gross terms, ought to be some kind of offset approaching "neutral?" but it looks like "the cost" is every "negative" think they can throw into a pile with ZERO recognition of any offsets. Ha, ha.....with all those gubment employees with a nest egg spending it on vacations as I've heard from Faux Spews that they do........seems like the economy should get a boost???? Another thing: non-essential government workers might not get any back-payment: only those who had to go to work without pay will get their money for certain, but it is far from clear that those told to stay at home will. Of course that will be offset by all the extra carbon that will be emitted after the shutdown by burning the midnight oil. Indeed... I held my laptop upside down to make sense of it. Things move fast. At noon today, Trump sent Pelosi a notice that he would be arriving on January 29 to give the SOTU address. Nancy immediately fired back that he would NOT be allowed to do that as long as the government is shut down. Who's got the bigger balls, Donny boy? I'm loving this. Trump, if we are lucky, will die of a stroke of apoplexy. I sincerely hope he does. I can see Trump showing up at the doors of Congress. ........................I don't really see Nancy........baring his continued entrance. I could see her turning off the mike, and the lights. but to "physically prevent?" That would be a set of balls on any of the Capitol Police..........as I think the Sergeant at Arms is about 90 years old. She wouldn't do that to him would she?????? Trump will NOT show up there. The law is crystal clear, and even his sycophantic inner circle knows that such a blatant violation of the Constitution would meet with devastating reprisals from all law enforcement and even his own tame Supreme Court. No matter how much he'd like to do it, he can't, and his handlers won't let him do it. This website has a tool that's supposed to let you adjust the sounds until you hear the word you didn't hear to begin with. If you hear "Laurel" you move it to the right, if you hear "Yanny" you move it to the left. Except I can't get it to work, all I ever hear is "Laurel". Well, Nancy Pelosi got an unconditional surrender on SOTU. That's VE Day for her. Now, for VJ Day she needs Trump to agree to negotiate over the wall after the government opens. That may require the political equivalent of the Hiroshima Bomb. That's overstating things a bit. Yup. It's called hyperbole (literally "overthrowing" or "throwing too far", in short, exaggerating). But it was an unconditional surrender on SOTU, and must have tied ol' Donny in knots. I can imagine the teeth-gritting, fist-clenching effort he had to put into that tweet. I'm surprised his fingers would even lift to type it out. He gave the SOTU via a tweet? You know, for the life of me I don't understand what "lost productivity" means. On the face of it........seems to me "the economy" should be SAVING the cost of the paychecks not paid out. Is that even an offset?.......or is it just negatives all the way down. anyone brave enough to offer an explanation that would make sense to a high schooler? The salaried workers get paid retrospectively. The work that was performed by contractors, still needs to take place, and as contractors are leaving the market due to the shutdown, the remaining contractors can increase price. In Commonwealth countries, it is illegal to have two matters covered by the same parliamentary bill. Each matter must stand on its own. Secondly, if a Commonwealth government "blocks supply" (government funding) that government falls and a new election is called by the governor general or monarch's representative. This is to stop this sort of nonsense taking place. Some workers might depend on overtime pay that they certainly won't get back. looks like Mueller is putting Roger's loyalty to Trump to the test. I like the title of your post! This is about the only glimmer of good news I see at the moment. I'm gravely concerned about Trump's planned grab for emergency power. Whether we can beat back that threat is very doubtful. But we have to try. Seen the video of the arrest? looks like the FBI expected Stone to make a last stand involving AP rounds and grenade launchers. In Commonwealth countries, it is illegal to have two matters covered by the same parliamentary bill. Each matter must stand on its own. Secondly, if a Commonwealth government "blocks supply" (government funding) that government falls and a new election is called by the governor general or monarch's representative. Your fluency in diplo-speak and legalese seems unbounded. What is it called when someone other than the democratically-elected president of a country is recognized as its leader? retrospectively: In a manner contemplative of past events /// Works for me to describe retroactive pay........but doesn't explain how "productivity" was lost............well........ok........for instance: permits not granted so oil wells not opened up or a new liquor is not put into the marketplace. I can see "some" lost productivity there: but NOT BASED on the paychecks not issued but rather the "work" not done that would not be caught up on once the shut down is over. I assume very much of it is. IOW: the lost of productivity is more hype than reality, like all the horror stories told BEFORE even the first paycheck was not received. As to the oil wells and liquor....seems again that much of that "loss" would be picked up by other providers? I can accept not all of it so "some" productivity is lost....just not all the hype that is out there. For the few contractors that go out of business........the remaining contractor still have to compete for the contracts based on quality and price.....and that will not take place for months later. Sounds too contrived to me. Two matters covered by the same parliamentary bill........doesn't make sense to me, but unless you got something snappy: no need for a second try. My "Recap" (ref to English Multi-topic) then I I understand and accept there is "some" loss of productivity: just no where near what is claimed, nor based on any gross contribution of wages not paid in 4-5-6 weeks. Its not lies vs truth but what truth is in all the lies? I don't understand this complaint. Are you upset that Matthew described the process in Commonwealth countries correctly? The dispute hinges on whether or not he was democratically elected. I didn't give Matts comment much of a look until your comment. WOW!!!!!! I thought "The Commonwealth" was old History from 100 years ago?.....Like ending in bits and pieces as when Ghandi got UK kicked out of India??? ....but that is "all wrong." Ha, ha.....what a rube I am. It still doesn't "fit" with what I see "apparently" going on in world news. I've NEVER HEARD of Canadas or Indias Governor General doing "anything" and the Monarch just promising to attend some function and sending her kiddies instead? A "Ceremonial Monarch" only, instead of Movie Stars and Tourist Guides?